For nearly two decades, the Bayfront Maritime Center (BMC) in Erie, Pennsylvania, has been using innovative programming and out-of-the-box thinking to get students and community members engaged and on the water. BMC’s latest initiative is true to form – the Center is creating a representation of an historic gunboat schooner called Porcupine from a semi-finished fiberglass hull it received as a donation in September, 2014. Construction is rolling along, and BMC plans to have Porcupine sailing as a “Schoolship” by this summer. Once she’s launched, Porcupine will be the 93rd vessel BMC has built and, at 43 feet in length and nearly 15 feet in the beam, the largest by far. Even more importantly, her capacity of 28 to 30 students on daysails and 12 on overnights will expand the reach of BMC’s programming exponentially with programs focused on Erie’s greatest natural resource, Presque Isle Bay. The onboard, underway lessons will explore STEM, ecology, and history for students from 4th grade on up, with plenty of opportunities for adults to get involved with evening and weekend sails. Since BMC moved into its new waterfront campus in 2003, creating something like Porcupine was part of the long-term plan, but the exact approach hadn’t been planned out. A variety of maritime-themed programs – including the Bayfront Alternative Education Program for Erie School District Students, Project SAIL (an after-school job skills program), the Bayfront Summer Program for high school credit recovery, Veterans at EASE (Pennsylvania’s first and only adaptive sailing program), and more – were keeping the BMC staff plenty busy. A subsequent Internet research revealed the Spray 40 was not your average modern keelboat. Roberts’ Spray 40 lines, while modern in places, evoked enough of a 19th century shape to be intriguing. In July of 2014, Eisenberg went to see the hull with local sailmaker David Bierig. A local maritime legend who has been sailing and restoring classic yachts for over half a century, Bierig’s eye for what BMC might do with this particular Spray 40 was vital. 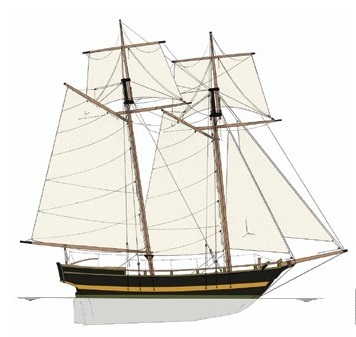 Bierig and Eisenberg believed the hull would be a great match for one of the three small “gunboat” schooners built in Erie to fight the British in during the War of 1812. Construction of these three vessels was overseen by Daniel Dobbins, an Erie mariner who petitioned President Madison that Presque Isle Bay gave the port of Erie the perfect protection for building the necessary ships to engage the British. The exact dimensions of these ships aren’t available, but the smaller twin schooners Tigress and Porcupine are believed to have been 45-50 feet on deck, making them acceptable matches for the Spray 40 hull. For a vessel intended to engage students of all ages, Bierig suggested that Porcupine seemed the far better name. Bierig and Eisenberg agreed to the donation and became Co-Directors of “Team Porcupine.” The ranks quickly grew to include local historian, author, and business professor David Frew, who quickly began research on the vessel. Frew quickly became so fascinated by Porcupine’s history that he’s published a book – The Schooner Porcupine: Daniel Dobbins’ Lake Erie Masterpiece – detailing her surprisingly long career. While she was purpose built for single use in the Battle of Lake Erie in 1813, Porcupine saw action throughout the War of 1812 and, unlike the six other small vessels from Commander Oliver Hazard Perry’s squadron, she was still intact and in American possession when the war ended – all six of the other small U.S. vessels were either captured or burned by the British. By 1820, the three larger brigs from the battle – Lawrence, Niagara, and Caledonia – were scuttled. But Porcupine was just getting started. She served the U.S. in the Coastal Survey Office on Lake Huron and as a revenue cutter for the Detroit River before being sold into private service, hauling cargo under the name Caroline until 1873. This 60-year run fits perfectly into BMC’s vision of the new Porcupine as a sustainable educational asset to the Erie Bayfront: a vessel made of low-maintenance materials, with the look and feel of the Golden Age of Sail. Creating such an amalgamation of modern materials and old world flavor is no easy task, but BMC has an ace up their sleeve as far as shipwrights go. In every harbor, there’s one guy who makes the impossible look easy. In Erie, that guy is Bob Arlet. Now running his own boat building and repair business after 19 years as carpenter and shipwright for the U.S. Brig Niagara, Arlet has been breaking down the complex pieces of Porcupine into workable jobs that he and apprentice shipwright Nick Rinn – a former BMC student – and a handful of volunteers tackle on a daily basis. So far, Porcupine has had some serious modifications on her path from Spray 40 to historic representation. 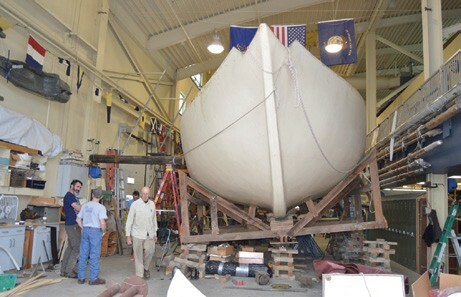 In August, a 7,800-pound steel ballast keel was attached to offset the tops’l schooner rig she will carry and create lateral plane for going to weather. A lazarette compartment was added in September to create storage and extend the stern into a much more historic looking overhang. The bow, too, was modified into a more evocative 1812 shape in October. In November, the old fiberglass deck was removed to make way for a new one that will be made with two underlayers of marine plywood and Douglas Fir planking. Charting the course of all these changes is Naval Architect Iver Franzen. While he now lives and works out of Annapolis, Maryland, Iver was born and raised in Erie like the rest of Team Porcupine. Having worked with Thomas Gilmer on such impressive historic ship reproductions as Kalmar Nyckle and Pride of Baltimore II, he’s just the guy to help navigate the complex process of U.S. Coast Guard certification. As work on Porcupine drills down to smaller projects, such as belaying pins, blocks, cleats, and deadeyes, BMC is involving students from its own programs, and from local school districts. That success is tangible. In the past six years, over 85% of the high school seniors BMC has worked with have earned their diplomas. It isn’t always an easy road, but BMC’s non-traditional and hands-on methods help get, and keep, students on track. It takes perseverance, by both the student and the instructors. Porcupine embodies this spirit of perseverance in her name, the unbelievably long history of the original vessel, and the compelling story of her commanding officer, George Senat. A Louisiana-born Creole who spent his early years fishing the bayous, Senat wanted to join the Navy when the War of 1812 broke out, but could only find Army billets open to him down South. The determined and intrepid Senat then walked from New Orleans to Buffalo in 75 days to complete his quest of becoming a sailor. By August of 1813, he’d been promoted to Acting Sailing Master and was in command of Porcupine when she met the British on Lake Erie. Like Senat, BMC’s students often have a path that is difficult and not straightforward. But through engaging and creative programming, they reach their goals and are transformed by the work they’ve done at BMC. Introducing Porcupine will expand programming and reach thousands more students, and have the potential to transform that many more lives. But first, the schooner herself needs some transforming. 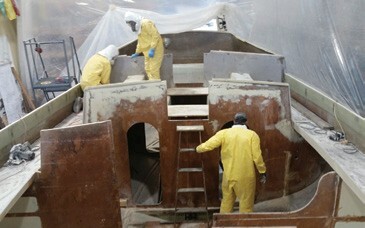 Follow the progress at schoonerporcupine.org and on Facebook at Gunboat Schooner Porcupine at BMC.